I used to feel so secretly smug that my baby was a good sleeper. Not for me this waking up every hour for a screaming hungry devil in angel's clothing. But then three things happened that somehow changed everything. Firstly we went on holiday where she got used to constant attention from my parents-in-law who tagged along, and also got used to sleeping in the same room as me and hubby. Then we moved house two weeks after getting back to the UK, which meant two weeks of general disruption and Lucy not receiving much attention at all. And though she seems very happy in her new home I think maybe she is still unsettled when waking in a strange room every night. Lastly, she has become a toddler over the past weeks and will imminently turn one. So who knows what physical changes are going on in that little body causing her discomfort. And of course she is still teething. So all in all it's a pretty toxic combination for Lucy and consequently for me. She has only slept through the night once in about a month. All other nights she is waking between 3 and 5 times and won't re-settle if I leave the room. So I'm pretty knackered and worse, it's showing on my face with more lines around my eyes appearing daily and an overall haggard look adding to the charm. So all I have to keep me going at the moment are a bottle of Olay Beauty Fluid, a jar of Vaseline and two travel size tubes of Sudacrem that their PR people kindly sent me. In fact those little tubes have been brilliantly handy both on holiday and during the move. 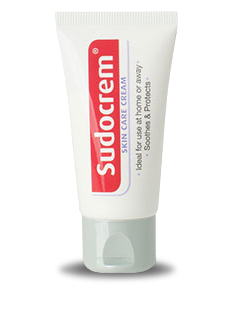 The original formula Sudocrem skincare is obviously great for spot emergencies and nappy rash, but was also an excellent treatment for sunburn. 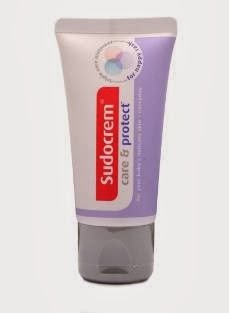 And the new Care and Protect cream seems to be a good preventative, for spot breakouts at least. Lucy doesn't get a lot of nappy rash so I couldn't really tell if it worked as a preventative measure. I've been using the Care and Protect cream before bed on my problem areas, after washing my face and applying the Olay. Then I slather some Vaseline around my eyes and frown lines (would prefer smile lines but whatever) and on my lips. Job done. I'm not sure I look any better in the morning but at least I'm keeping the old fizzog ticking over until I can bring in the big guns and the anti-wrinkle serum. I do love Olay products though so I might give some of their anti-aging stuff a try when I start getting paid again. Somehow dealing with the lack of sleep seemed easier when Lucy was a baby. Perhaps it was just that I expected to not get much sleep back then but, probably unreasonably, I expected to get more sleep as she gets older. Time to crack out the books on sleep training I guess. State-of-the-art infrastructure, market relevant courses, qualified and well-trained faculty, dedicated placement.